Fig. 25. —-Extending 6-ft to 9-ft Dining Table with Screw. Figs. 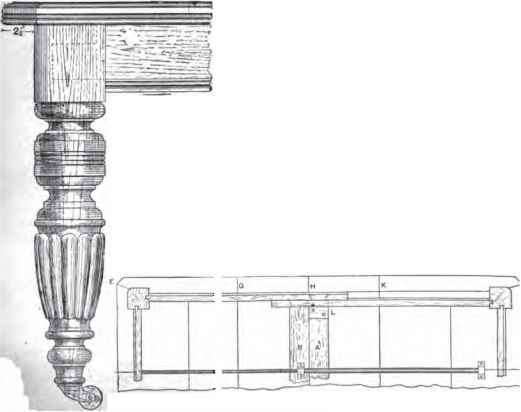 26 and 27.—End and Side Elevations of Extending Dining Table. Fig. 28.—Half Plan and Half Underneath View of Extending Dining Table. 30.—Part Plan of Framework of Table, Extended. 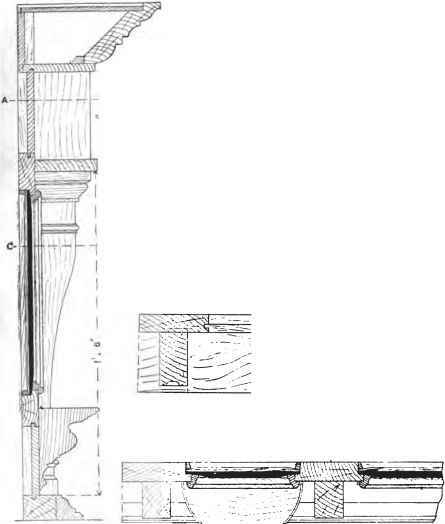 26 and 27.—End and Side Elevations of Extending Dining Table. 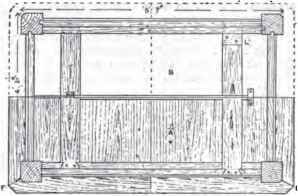 28.—Half Plan and Half Underneath View of Extending Dining Table. 29.—Tamed Leg of Dining Table. Fig. 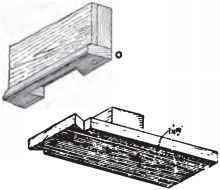 33.—Section through Sliding Bails of Table. Fig. S3.—Joint between Cross and Side Rails of Table. inserted obliquely, as clearly shown in an illustration (Fig. 32) given below. Fixing the Screw and Barrel.—The screw and barrel should now be fixed. Secure the handle end of the screw to the end rail of the table. To the cross rail b (Figs. 30 and 31) fix the box in which the screw works, and which holds one end of the barrel ; fix the other end of the barrel to the under side of the top, a wood block probably being necessary for this purpose. Slightly tighten the screw so as to hold the top firmly together, plane the top anU leaves, and work the moulding round the edges. S3.—Joint between Cross and Side Rails of Table. 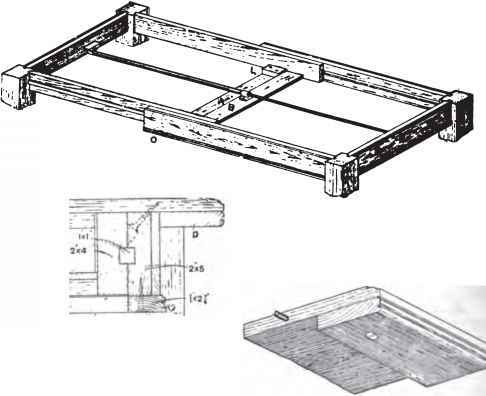 33.—Section through Sliding Bails of Table. 31.—Framework of Extending Dining Table. Fig. 34.—Corner of Table Leal will extend to i> ft. with two 1-ft. «»-in. leaves. It would be firmer if it extended to 8 ft. in. only, with leaves 1 ft. 3 in. wide. This would give the sliding rails a_ lap of 2 ft. instead of 1 ft. 6 in. Fig. 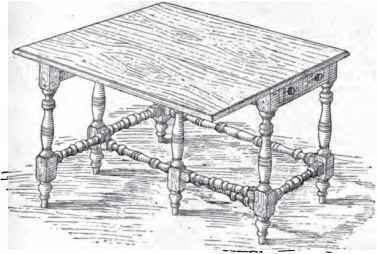 SB.—Falling-leaf Gate-leg Table with Turned Legs and Bails. Fig. 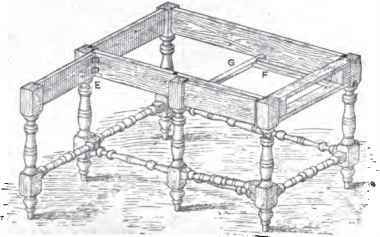 36.—Framework of Falling-leaf Gate-leg Table.